Chewbacca doesn’t count as an easter egg. Major spoilers for Solo: A Star Wars Story below. You may be wondering how I knew to include umlauts over the a’s in that term. Well, dear reader, if you’d been a Star Wars nut with a subscription to GamePro during the second term of the Clinton administration, you’d know the proper diacritics, too. Teräs Käsi (the words are borrowed from Finnish — it’s a grammatically incorrect translation of “steel hand”) is a fictional combat style invented for the 1997 Sony PlayStation fighting game Star Wars: Masters of Teräs Käsi, in which one could tussle with the CPU or a friend while embodied as Luke Skywalker, Princess Leia, or various other figures from the Star Wars mythos. It was a critical disaster. Though the game has its defenders and there are many thousands who played it despite its quality (it came out in the buzzy year of the Star Wars Special Edition theatrical rereleases, after all), Masters of Teräs Käsi is hardly a beloved touchstone. Which is precisely why I was so surprised to hear it name-dropped. Pleasantly surprised, I should add — and not for the first or last time. As one might expect, Solo is peppered with easter-egg shout-outs to preexisting components of the Star Wars galaxy. But what I wasn’t expecting was how much I would enjoy them. We live in an age when we’re inundated with wink-y reference points in franchise pictures, and all too often, they’re obvious ones that are beaten over our heads — or, worse, if they’re not obvious, they leave uninformed viewers baffled as to what just happened. In that light, Solo’s understated, often-obscure intertextuality is refreshing and rewarding. Harking back to old source material is hardly a new phenomenon in the post-Disney Star Wars movie playbook. As has been pointed out ad nauseum by smug analysts, 2015’s The Force Awakens was in many ways a structural retread of 1977’s A New Hope: A trio of protagonists, one of them a roguish pilot and one of them a Force-sensitive desert orphan, are thrown together and have to blow up some fascists’ world-killing weapon. The next year’s Rogue One was predicated entirely on the notion that you’d be interested in spending two hours learning the lead-up to the first scene of A New Hope. The Last Jedi was all about breaking your favorite toys, but it assumed that you’d brought those toys with you to the theater. Given all that, it’s been generally assumed that Solo would be a labored effort to overexplain the origin threads of Han Solo’s gestalt. Indeed, a widely circulated bit of preemptive eye-rolling came in the form of a bingo card featuring all the things the card’s creator thought were likely to pop up. While a few of the predictions were on the money (e.g. we see the Kessel Run; we find out how Han got his blaster; and no, “Solo” is not his real name), I’m happy to report that one can’t actually get a bingo — the vast majority of those plot points didn’t come to pass in Lawrence and Jonathan Kasdan’s script. Han’s penchant for vests goes blissfully unexplained, no dice on the provenance of his dice, and — thank the Maker — there’s no de-aged CGI Harrison Ford. Instead, we’re given bits of fan service that are charmingly micro-targeted and cleverly unobtrusive. If you’re a normal person who hasn’t seen the appeal of sinking a significant percentage of one’s life and income into the Star Wars legendarium, virtually all of these moments can pass you by, unnoticed. To wit: Did you catch the line where it’s said that Tobias Beckett (Woody Harrelson) is known throughout the galaxy for killing Aurra Sing? True believers will know that Sing is an albino bounty hunter who first appeared (and I mean appeared — she didn’t even get any lines) in The Phantom Menace and was developed only in spinoff cartoons, comics, and novels. She’s blasted her way into a select group of hearts and minds over the past two decades, so for a certain kind of devotee, linking Beckett to Sing is a nice way to situate his new character in an existing framework. It’ll send a legion of Wookieepedia users rushing to be the one who first gets to update her entry with news of her death — but if you have no idea who I’m talking about here, your enjoyment of that line is uninterrupted. There’s no dramatic pause or musical sting to emphasize the significance of the moment. As such, it indirectly says that, unlike, say, the post-credits scene from Avengers: Infinity War, the sequence isn’t expecting you to have any prior knowledge of the thing being referenced. But if you do have that knowledge, it’s a fun little nudge. Other examples abound, but — and, again, this is a virtue — you probably missed most of them. The massive, swirling gravity well near Kessel known as the Maw? First introduced in the 1994 novel Jedi Search, part of the much-loved “Jedi Academy” series. Thandie Newton’s Val berates Beckett for not hiring bounty hunter Bossk, first glimpsed in The Empire Strikes Back. 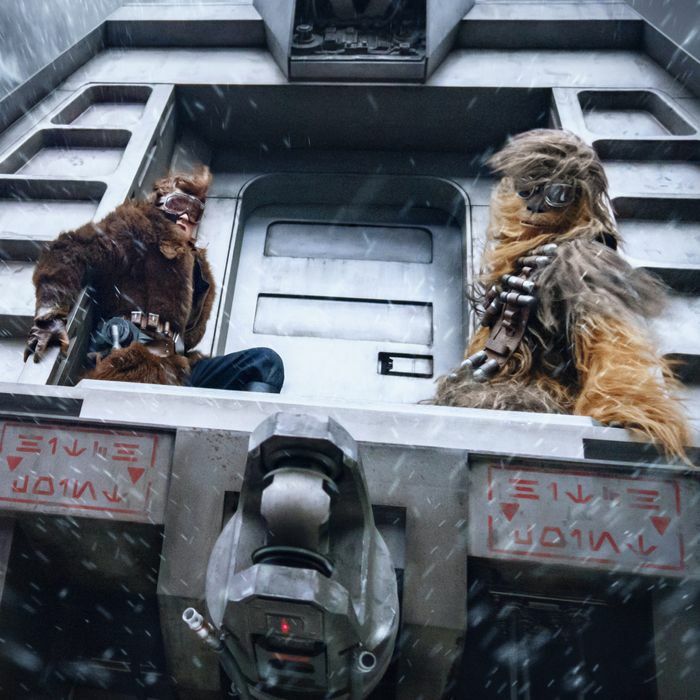 Early on in their relationship, Han calls Chewbacca (Joonas Suotamo) a “moof-milker” — an insult he’ll later repeat during The Force Awakens. The Cloud-Riders, Beckett’s rivals, made their debut (albeit in a significantly different form) in Marvel’s 1970s Star Wars comics. There are easily missed meta call-outs, as well: The little-person Cloud Rider seen near the end is former Ewok actor Warwick Davis; and director Ron Howard’s brother, Clint, can be seen in a space bar. * At a key moment, Han shoots first. I could go on. Of course, the counterargument here is that prior knowledge might actually make your experience less pleasant because you’ll notice all of the little bits and be distracted by them. That all comes down to a your-mileage-may-vary situation. I found these details to be immersive, merely triggering a little charge of pride at recognition before they instantly passed back into the narrative stream. They made me comfortable and curious. I was happy with how smart I felt and intrigued by the unusual nature of the choices, which wisely eschewed predictable stuff like cameos from Boba Fett or Jabba the Hutt. However, there’s one quasi-exception to my feelings here. In short: Dammit, I’m just not sure how I feel about that Darth Maul (er, sorry; according to the credits, he’s just going by “Maul” these days) appearance. When he’s revealed to be the hidden boss of Paul Bettany’s Dryden Vos, it’s a rare moment in which meaning is telegraphed. We’ve heard hints about the existence of Vos’s mysterious superior, so it’s clearly going to be a big to-do, and when we finally do see a hologram of him, the music swells and the camera zooms in. If you could never bring yourself to see the Prequel Trilogy and don’t remember its ad campaigns, you’ll be utterly lost at this pivotal moment. A case can be made that a stronger film would’ve invented an interesting new character as Vos’s boss and introduced them earlier in the film, so as to take the pressure off the reveal. Don’t get me wrong: I got very hot and bothered with glee over it because I’m made of trash. But I don’t know if I can condone the way the scene writes off anyone who didn’t do their homework. Oh, well, whatever; that bit is very much the exception. Nine times out of ten, the easter egg is under the radar. Intelligent people can disagree on this whole matter: Your viewing experience with Solo is greatly improved if you have (a) unresolved childhood issues regarding Star Wars and (b) very low expectations. But if you’re willing to follow the trail, you can find yourself in a mildly increased level of Star Wars immersion. Here’s hoping for a low-key Thrackan Sal-Solo appearance next time around. *An earlier version of this article misidentified the actor Warwick Davis as Kenny Baker.